Alan Lightman. Warner Books, New York, 1994. Sometimes you stumble onto a book that is sheer delight. 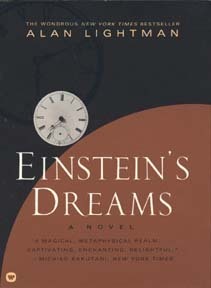 Einsteins Dreams is like that, an unlooked-for present to me from an old friend. In this tiny book, more poem than essay, MIT physicist Lightman teaches you about time — not like a physics teacher would, with equations and experiments, but rather by getting in your mind and playing. Like a child learning art by slapping paint around, you learn time by teasing it, tugging at it, twisting it. In Einsteins Dreams it is 1905 in Berne Switzerland, and a young patent clerk is dreaming wonderous dreams about the nature of time. He is finishing work on am idea of his he calls the special theory of relativity, and every night for the next 30 nights, as he struggles with his ideas, he dreams. In every dream world he visits, time operates differently. In one world, time is circular, people repeating their triumphs and mistakes over and over… In another, there is no time, only frozen moments. This book is an account of those dreams, an account that probes your idea of time, of possibility, of chance. The illusive image Lightman slowly builds in your imagination is of the very essence of time itself. Enormous fun. I wish I had taken Phusics in college at MIT under Lightman.